SARS (Severe Acute Respiratory Syndrome) first emerged in the Guangdong province of China. Yet after months of international travel, SARS developed throughout the world and according to the World Health Organization (WHO) 8,098 people became sick; 774 of which died. Thus, the WHO created a network of laboratories all around the world to identify the causative agent of SARS, which soon identified the novel coronavirus in SARS patients. How long does it take to become sick if I were exposed to SARS? What does 'close contact' mean? How long is a SARS patient infectious to others? What medical treatment is recommended for patients? First, SARS patients usually develop a high fever greater than 37.5°C. Then pneumonia-like symptoms, including headache, feeling of discomfort, chills, and body aches, become evident. After 2 to 7 days, patients may also develop a dry cough, which might associate with hypoxia in which insufficient oxygen is traveling to the blood. Therefore, in approximately 10 to 20 percent of the cases, mechanical ventilation is required. Below you can watch a movie about how to take body temperature. Temperature taking is very important to prevent SARS. SARS is caused by a new form of coronavirus called 'SARS-associated coronavirus' (SARS-CoV). Yet at this time, there is still a mystery whether other infectious agents are involved. One fact though is tests have proven that the coronavirus derived from animals - possibly a civet cat - not humans. SARS spread by close contact between people when for instance a SARS-affected person coughs or sneeze contagious droplets into the air. These droplets then travel to the mucous membrane of the mouth, nose or eyes of the person nearby. It can also spread by a person, or touching a surface or object contaminated with infectious droplets. The time between exposure to the SARS virus and onset of symptoms is called the incubation period. The incubation period for SARS is typically 2 to 7 days, although in some cases it may be as long as 10 days. According to the CDC (Centers for Disease Control and Prevention), close contact means when one has cared for or lived with a SARS-affected person or has a high probability of direct contact. As in with respiratory secretions and/or body fluids with the SARS patient such as kissing, embracing, sharing eating or drinking utensils or close conversations within 3 feet between people. CDC (Centers for Disease Control and Prevention) recommends that people with SARS restrict themselves from outside activities for 10 days after their symptoms have subsided. Although they are most infectious when symptoms occur, this is a precaution as patients are most infectious during the second week of illness. 1.1.2 Infected while working in another hospital, nurse Zhang looks out the window of the isolation ward of You'an Hospital in Beijing. 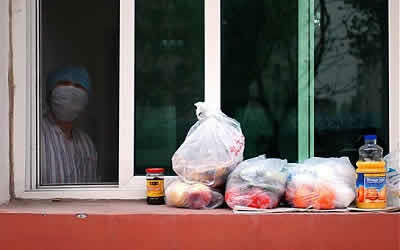 The food on her windowsill were placed there by relatives who were prevented from bringing anything into her room (used with permission of Lou Linwei, freelance photographer for TIME Magazine). CDC (Centers for Disease Control and Prevention) recommends that patients with SARS receive the same treatment that would be used for any patient with serious community-acquired atypical pneumonia. SARS-CoV (SARS coronavirus) is being tested against various antiviral drugs to see if an effective treatment can be found. Table with cumulative number of reported cases of SARS from the World Health Organization (WHO).